Microscope slides are amazing little things. With a few simple steps, prepared slides can catapult you into a whole world that you never realized existed. There are a lot of different types of slides, and many ways to prepare them. The most common type of slide is made from clear glass, although fiberglass and plastic slides are also available. Slides may be frosted in order to make the specimen stand out better, no matter what mount style is chosen. There are three mount styles that are most common. They are the wet mount, the dry mount and the prepared mount. The mount that works best depends on the type of sample and what the viewer is hoping to see. Want to learn how to prepare your own slides? 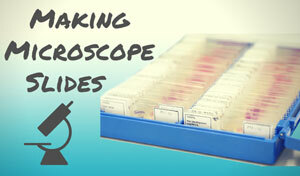 Check out the page on making microscopy slides. A wet mount slide is exactly what it sounds like. A specimen is suspended in some type of liquid between a blank microscope slide and a cover. The liquid refracts the light, making the specimen easier to see. Wet mounts let the viewer observe the natural color or movement of the specimen. 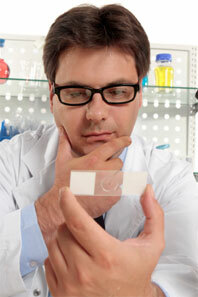 There are many types of liquids that can be used for a wet mount microscope slide. Aquatic specimens can be taken directly from the water they inhabit and put on the slide. Sometimes a salt-water solution is used to dilute the specimen in order to be able to view it. Glycerin is occasionally used because of its high refractive properties. It can dry out or kill live specimens, so it is better to use this mixture for plant species. Water and glycerin can be blended together if the light refraction needs to be lowered. Immersion oil can also be used to make wet mounts, but it doesn’t work well with synthetic materials. Immersion oil wet mounts are completed by placing a drop of oil on top of the cover of the slide. Specimens that don’t do well in water can be wet mounted with immersion oil. Wet mount prepared slides work very well for all types of samples. However, they will dry out over time. That is why wet slides are considered to be a temporary mount for specimens. Moving specimens can also be harder for the viewer to locate on the slide. The dry mount is by far the simplest of the three. The specimen can be placed onto the blank microscope slide, and a cover slip is typically placed over it. This is done to protect the specimen and the microscope objectives. It can also help keep the specimen still and flat on the slide. Dry mount slides work well for pollens, feathers or hair. It can also be used to examine any airborne particles that get caught in a membrane filter. Dry mounts are typically temporary, unless the cover is sealed in some way. The lack of a refractive substance may make it harder to view smaller and more detailed structures. Prepared mount slides are typically done for pathological or biological research. The preparation for these slides is very involved. The specimens need to be thinly sliced, a process usually done with a microtome. Any water that may be present in the sample needs to be removed. Once the specimen is dry, stains can be applied to highlight certain structures. A fixative is also used in order to protect the specimen from decay. If done correctly, a prepared mount slide can last virtually forever. 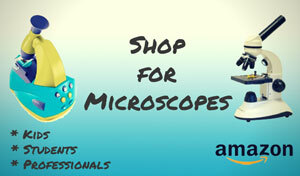 Read more about prepared microscope slides here. A microscope slide can let the viewer catch a glimpse of the world that surrounds them. Each mount preparation and slide material has its own uses and disadvantages. Whether it’s a wet mount on clear glass or a prepared mount on a frosted fiberglass slide, a well-made slide can be a viewing window into the microscopic world. If you want to purchase prepared slides, Amazon has a great selection. Shop prepared slides at Amazon. Celestron prepared slides (44410 model number) provide a fun and easy introduction to the microscopic world. This set comes with twenty-five prepared slides that contain plant, animal, and insect parts. Popular with both curious kids and adults, this set offers hours of educational entertainment at a very affordable price. Celestron prepared slides (44412 model number) are a step up from the 44410 model. This set comes with a whopping 100 prepared slides, offering an even broader introduction to basic microscopy. 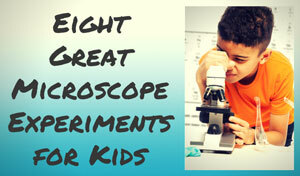 If you have a little more money to spend, this set will keep the budding scientist enthralled for a long time. 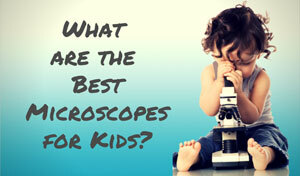 Prepared slides from Home Science Tools bring the microscopic world to life. Here we'll look at the different sets in order to help you choose the best one for your needs.